The readings for this Sunday are all about light vs. darkness, what God sees contrasted with what man cannot see, at least not without God's grace. In our first reading (1 Samuel 16:1, 6-7, 10-13), we hear about Samuel, who was sent on a mission to choose a new king of Israel from among the sons of Jesse. God saw what Samuel did not see; God looked into the heart and chose the ruddy youth David and anointed him to be the new King of Israel. The LORD said to Samuel: "Fill your horn with oil, and be on your way. I am sending you to Jesse of Bethlehem, for I have chosen my king from among his sons." As Jesse and his sons came to the sacrifice, Samuel looked at Eliab and thought, "Surely the LORD's anointed is here before him." But the LORD said to Samuel: "Do not judge from his appearance or from his lofty stature, because I have rejected him. Not as man sees does God see, because man sees the appearance but the LORD looks into the heart." In the same way Jesse presented seven sons before Samuel, but Samuel said to Jesse, "The LORD has not chosen any one of these." Then Samuel asked Jesse, "Are these all the sons you have?" Jesse replied, "There is still the youngest, who is tending the sheep." Samuel said to Jesse, "Send for him; we will not begin the sacrificial banquet until he arrives here." Jesse sent and had the young man brought to them. He was ruddy, a youth handsome to behold and making a splendid appearance. The LORD said, "There-anoint him, for this is the one!" Then Samuel, with the horn of oil in hand, anointed David in the presence of his brothers; and from that day on, the spirit of the LORD rushed upon David. In our Gospel reading (John 9:1-41), we hear the story of the man born blind who had his physical sight restored and later in the story, his spiritual sight. The man saw what the pharisees could see. Although they had physical sight, their spirits were in darkness, preventing them from seeing the Lord for who he is. As Jesus passed by he saw a man blind from birth. He spat on the ground and made clay with the saliva, and smeared the clay on his eyes, and said to him,"Go wash in the Pool of Siloam" - which means Sent - So he went and washed, and came back able to see. His neighbors and those who had seen him earlier as a beggar said,"Isn't this the one who used to sit and beg?" Some said, "It is, " but others said, "No, he just looks like him." He said, "I am." They brought the one who was once blind to the Pharisees. Now Jesus had made clay and opened his eyes on a sabbath. So then the Pharisees also asked him how he was able to see. He said to them, "He put clay on my eyes, and I washed, and now I can see." So some of the Pharisees said, "This man is not from God, because he does not keep the sabbath." But others said, "How can a sinful man do such signs?" And there was a division among them. So they said to the blind man again,"What do you have to say about him, since he opened your eyes?" He said, "He is a prophet." They answered and said to him, "You were born totally in sin, and are you trying to teach us?" Then they threw him out. When Jesus heard that they had thrown him out, he found him and said, "Do you believe in the Son of Man?" He answered and said, "Who is he, sir, that I may believe in him?" Jesus said to him, "You have seen him, and the one speaking with you is he." He said, "I do believe, Lord," and he worshiped him. In our Epistle reading (Ephesians 5:8-14), Saint Paul reminds us that we have had our spiritual sight restored in Christ Jesus - we are no longer in darkness but are children of the light. That brings certain expectations and responsibilities. Brothers and sisters: You were once darkness, but now you are light in the Lord. Live as children of light, for light produces every kind of goodness and righteousness and truth. Try to learn what is pleasing to the Lord. Take no part in the fruitless works of darkness; rather expose them, for it is shameful even to mention the things done by them in secret; but everything exposed by the light becomes visible, for everything that becomes visible is light. Therefore, it says: "Awake, O sleeper, and arise from the dead, and Christ will give you light." 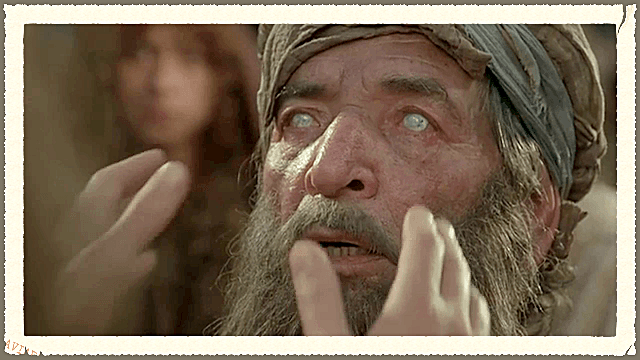 Physical blindness in today's Gospel is a metaphor for spiritual blindness. Even though we see the world around us with our eyes, without God's grace, we are still in darkness. Grace gives the eyes of our soul the ability to see God, to know God. As Saint Paul tells us, we must "Live as children of the light."